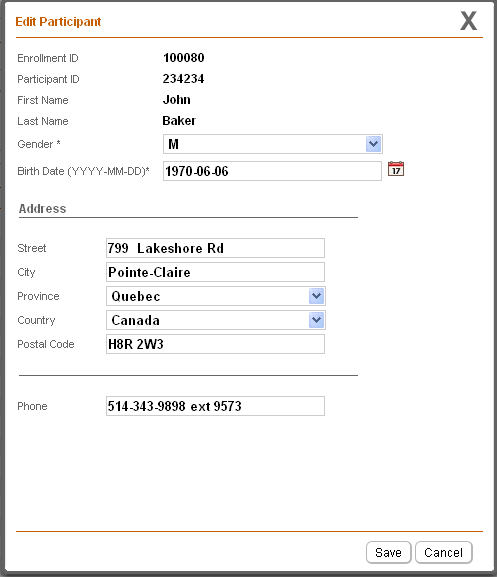 After a participant has been received or enrolled, a participant manager can edit their registration information. It is potentially dangerous to change a participant’s registration information after their interview has been started. For example, changing the participant’s gender could cause a problem since some physical measurements and questionnaires depend on it. Onyx does not prevent you from creating this kind of problem. Each study defines the registration information that is stored for a participant. Certain key information (such as the participant’s name and ID numbers) cannot be changed after the participant was received or enrolled. Other information can be modified. Find the participant whose information you want to edit. If you need help finding the participant, see Finding a Participant. To edit a participant’s registration information, click their Edit link. Select the Edit link for the participant. The Edit Participant dialog is displayed. See this figure. Each study defines the information that is stored for its participants. You may not see the same fields as those shown in this figure. 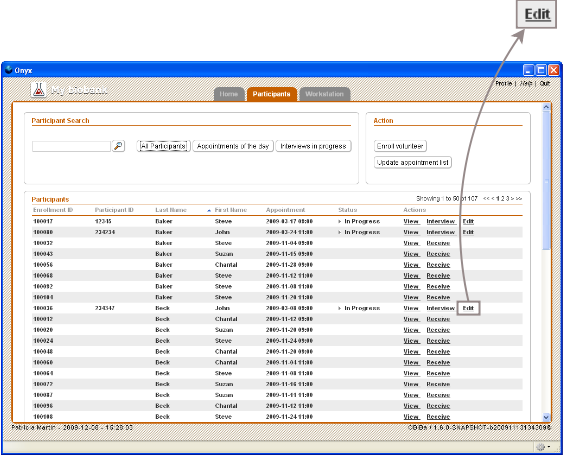 Edit Participant dialogeach study defines which information is stored for its participants. Make the necessary changes. Certain key information (such as the participant’s name and ID numbers) cannot be edited. If you decide not to store the changes, select the Cancel button. If you want to proceed with changing the information, select the Save button. The Edit Participant dialog closes. Your changes have been stored in the Onyx database.